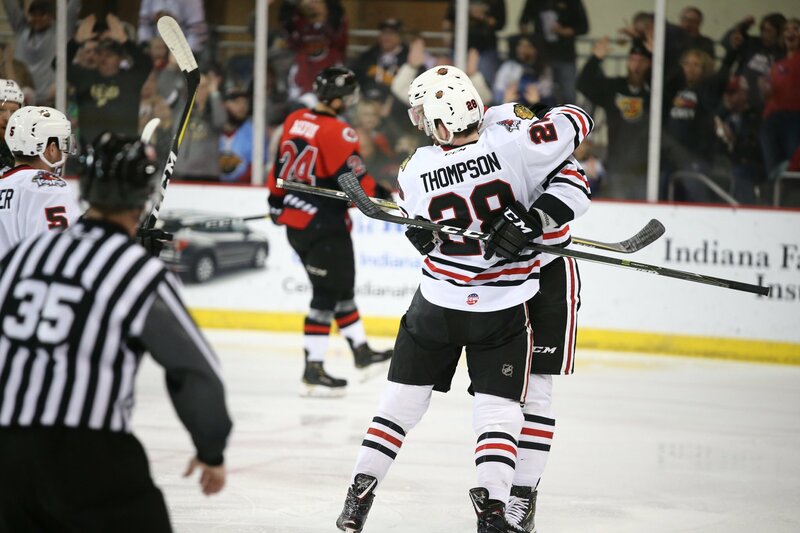 The Indy Fuel continued their three-game weekend with a matchup against the ECHL-leading Cincinnati Cyclones. It was a hard fought contest from start to finish, but the Cyclones got the best of the Fuel. Indy dropped this game 4-3. The action started early in this one. Less than five minutes in, Radovan Bondra gave the Fuel the early 1-0 with his 10th goal of the season. The physicality was certainly present as many big hits by both teams kept the crowd entertained. Cincinnati had a quick answer to the Fuel goal, however. Myles Powell beat Matt Tomkins for his 29th goal of the season to tie the score at 1-1. Just 20 seconds later, Spencer Dorowicz gave the Cyclones the lead with his seventh of the season. With the score 2-1, Bondra got whistled for cross-checking and it cost him the game. Less than three minutes later, Cincinnati’s Justin Vaive got called for tripping. On the resulting four-on-four, Cincinnati put one in their own net that was credited to Logan Nelson for his 14th tally of the season. The 2-2 score would last as the teams went to the locker rooms for the first intermission. The second period was much more uneventful than the first. Cyclones netminder Ty Rimmer stood his ground against Indy’s Brett Welychka a handful of times as the Fuel forward had a couple of quality looks against him. Save for a couple of penalties, one on each team, the middle frame saw some post-whistle antics and not much else. The score remained 2-2 going to the final period. The third period started fast, much like the first. Less than four minutes into the period, Ryan Rupert beat Rimmer off a great pass from his twin brother Matt to give Indy a 3-2 lead. It was his 24th tally of the season. It wouldn’t last long, however, as just over three minutes later, Brady Vail put a shot over the left shoulder of Tomkins to tie the score back up at 3-3. Continuing the trend of goals in quick succession, Justin Vaive put the Cyclones up for good just 28 seconds after Vail’s goal. Indy couldn’t find the equalizer and dropped this game 4-3. The Fuel finish their three-game weekend and five-game homestand with a game against the Kansas City Mavericks this afternoon. Puck drop is set for 3:05 pm ET from the Indiana Farmers Coliseum.